The 18th East Africa hub meeting took place in Mwanza, Tanzania last week (21-24 September 2016), the hub coincided with an internal reflection of SDI’s theory of change, and the meeting provided a huge opportunity to enrich the discussions with regional inputs from the other affiliates. The Mwanza meeting follows the last one held in Kampala, Uganda in May earlier this year. Proceedings from the first day of the hub meeting revolved around the spirit of cooperation between the federations through sharing knowledge, capacities and lessons for inclusive city development as well as partner with government institutions for mutual collaborations and scale up of community projects. This was broadly reiterated in the key note address by the Deputy Mayor of Mwanza Hon. Mohammed, who officially opened the 18th session of the East African hub. The meeting opened with a performance from the host country Tanzania to bring about the right mood into play. Subsequent conversations on profiling and enumerations indicated an emerging trend by the three affiliates of going beyond counting slum communities to effectively using the information collected for action through precedent setting projects. All affiliate narratives demonstrated growth towards making effective use of the data and maps generated through profiles, household surveys and spatial analysis of slums. The experience of the Ugandan affiliate in the city of Kampala is an example of how affiliates are using the information – translating the figures from the surveys to tangible results for the urban poor in Uganda. The hub meetings, which have been employing the SDI Learning Monitoring and Evaluation Reporting Framework as the basis for the reflections, which often is a tool for facilitating and deepening learning processes and instilling values in the community processes. However, in this round of the hub, the affiliates dedicated time to conceptualize SDI’s theory of Change. The concept of theory of change was introduced to the hub by Mara Forbes of the SDI Secretariat. The objectives of community-based programs and projects in the model of theory of change is to empower federations to carefully work with urban poor communities to naturally find units of solutions to their problems through practice, engagement and agenda setting thus creating an enabling environment for intervention at the city level. However, for this to be achieved, necessitates a careful assessment of community structures and processes, in advance, of any intervention. It also requires an insider understanding of the community to identify and work with the solutions to address community and city challenges. This approach may include strengthening community through neighborhood organizations and network linkages, including informal social networks, ties between federations and the governments that serve them, and connections among community organizations to strengthen their ability to collaborate. The recent review of theory of change highlighted that differences can be observed in the form of outcomes produced by different affiliates. For example, SDI’s learning, monitoring and evaluation tool identifies the federation activities—and the when—to be undertaken in any change process and their links to expected intermediate- and longer-term outcomes. In three groups, federation members discussed some of the changes at the city scale influenced by federation rituals, engagements and activities. They also collected ideas on how to make the theory of change more successful and sustainable in the context of their cities. It was appreciated by the hub members that the Internal evaluation of the three federations that the theory of change is invaluable for spelling out the LM&E sequenced activities and mechanics that provides little understanding of the how and why—the underlying process, dynamics and conditions under which community change takes place. Prior to the field visit to one of the federation model of Biofill sanitation project in Mwanza, the hub meeting first tackled the remaining issues on its agenda. The latter included country report presentations, which largely highlighted the affiliate’s initiatives on mobilisation, moving from data collection to action and deepening of partnerships and growing collaborations with governments through precedent setting projects. Affiliates narrated the range of efforts and initiatives that had been started in each country to strengthen relationships with government. All of the three affiliates have made considerable milestones towards institutionalizing engagements with their city and national governments. In most cases this was being realised through the signing of Memoranda of Understanding that not only target formalising relations but also provide a clear framework for meaningful co-operation around concrete pilot activities. 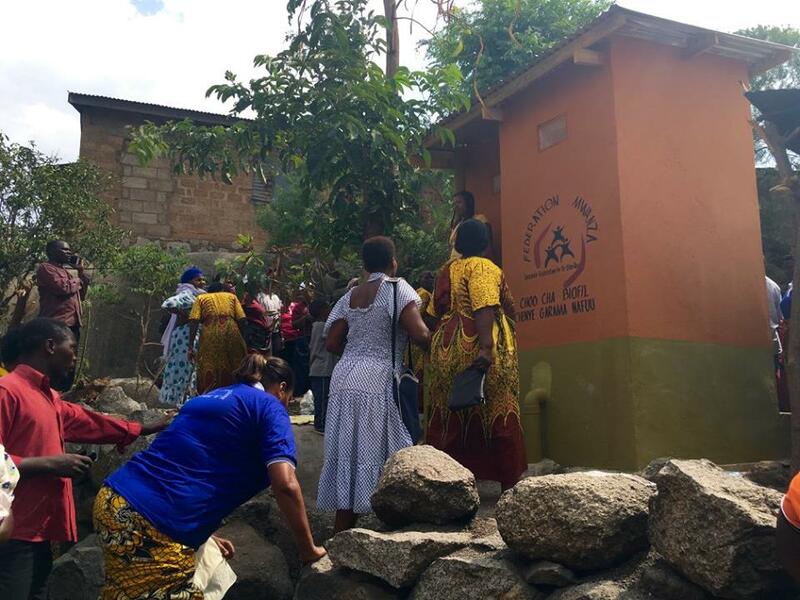 In Kenya, an MOU with the Kiambu County government has led to an agreement on the Kiandutu upgrading framework as well as co-production in providing a sanitation solution for the city. The federation has also made inroads with the city of Nairobi to prioritize the creation and legislation of a Nairobi Special Housing Fund to enable the poor access financing for upgrading. In the case of Uganda, an MOU set the stage for strategic sharing of enumeration and profiling data with the Kampala Capital City Authority and through precedent project setting coined an approach to Community Contracting process with various municipalities to utilize community skills in urban development. Interestingly, progress was also being registered by the Tanzania federation in terms of developing strategic links with government. The affiliates stressed the need for support from the hub to guide these engagement processes. Slum dwellers are faced with a paradox, however. By their very nature, they are drawn to be part of the city decision making process, owing to the informative data gathered on informal settlements However, the real story – the scale opportunity just waiting to be cracked – is in the partnership between the poor and their governments. Can slum dwellers and city authorities do it? In 2016, this is a very real focus. Of course, the challenges are not insignificant. But increasingly, slum dwellers, governments, investors and developers are noting that the potential benefits outweigh the risks. And, as governments come to appreciate the potential that this interest offers, their efforts to streamline development processes through inclusive participation of the urban poor to grow through creating new opportunities that are beginning to change the face of African cities. The session discussions conducted by the three affiliates making up the East African Hub proved to be very informative. The presentations highlighted how the different affiliates had seriously considered both internal and external challenges that could potentially threaten the Federation processes and projects. Typical internal challenges shared by most affiliates included leadership and governance, broaden the capacity of the members through exchanges and capacity building. Strengthening accountability systems around governance, finances and projects was cited as one way for dealing with such problems. Day 3 of the hub meeting started with a discussion on upcoming exchange visits, and a reflection on the federations´ partnerships with governments. At the end of the hub meeting, the federation members were satisfied with the achievements and the learning outcomes of the meeting as well as the elaborate refinement of theory of change. The next regional hub meeting will take place in Kenya.